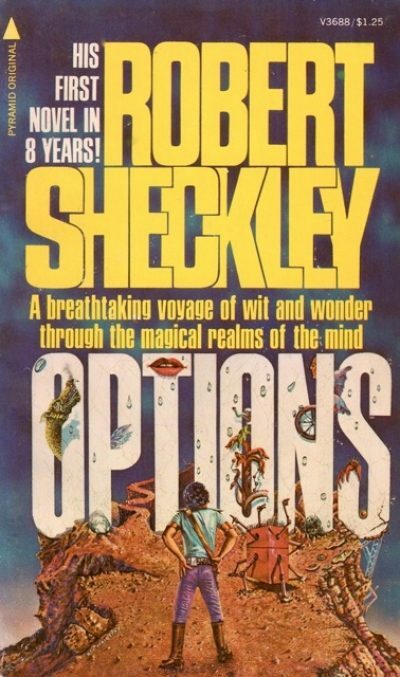 1975’s Options ended an eight-year drought in Robert Sheckley novels. Forced by equipment breakdown to set down on an alien world, Tom Mishkin is at first optimistic. There should be a convenient cache of spare parts nearby. He discovers, to his great distress, that the cache had been cannily dispersed. If an ailing space craft crash lands, only a small fraction of the cache will be lost. The part he needs is only a few miles away; however it is a few miles through an alien realm for which Tom’s terrestrial senses are poorly suited. This is an entirely predictable problem and one for which a known fix exists. Tom will be accompanied by a helpful Special Purpose Environmental Response robot, an intelligent machine programmed to understand and deal with the challenges of Darbis IV. Which would be great if the robot and Tom were on Darbis IV and not where they actually are, that is, the planet Harmonium. The sensible thing to do would be to turn back and send out a distress call asking for a properly programmed SPER robot. However, Tom knows that the part he needs is only a few miles away; he knows that it could take months or years for a replacement robot or part to arrive. And he and his robot are already out in the jungle. The urge to press on is irresistible. Elsewhere, mysterious forces under the command of the Man of a Thousand Disguises are being marshaled to rescue poor Tom. As if that will do Tom any good…. Robert Sheckley was a highly regarded SF humourist, someone whose works were often adapted, to big and little screens as well as radio. Sometimes these adaptations resembled the original story. He specialized in absurdist plots, often driven by his protagonists’ steadfast disinterest in performing anything like due diligence. It was a style that could drive critics like Blish and Knight into a fury 1. I don’t know if either Blish or Knight read Options2; if they did, I wonder what they thought of it. One way to look at this book is as an attack on the idea that the author controls their fictional worlds. The author, the Man of a Thousand Disguises, has the best intentions where Tom is concerned. Alas, all for naught: every gambit he considers is doomed before he puts pen to paper. Even an attempt to replace Tom with a more heroic protagonist ultimately goes nowhere. Not only is Tom the victim of forces he cannot comprehend, so is his creator. In fact, the Man of a Thousand Disguises’ control over his work does not extend even so far as ensuring a conventional narrative. Sheckley, for his part, has no interest in such things. Instead, Sheckley gleefully wanders off into the Land of Digressions and Non Sequiturs in his exploration of what it means to be an author. I expect that there are people who would be enraged by Sheckley’s brand of surrealist absurdism. Fourteen-year-old me loved it. It helps that Sheckley knows how many pages his little joke can support and does not overstay his welcome. Options might not have been to many people’s tastes. It seems to have been out of print for much of the 1980s, 1990s, and 2000s. Happily, we live in a golden age of ebook reprints and not only is there an SF Gateway edition , Open Road Media also offers Options for sale. 1: I am not absolutely sure that Sheckley’s work enraged them. I cannot check, as I cannot remember where I filed collected criticism, but I vaguely remember that it was one or the other of them who was driven to distraction by Sheckley’s use of idiot plots in the AAA Ace stories. 2: Blish probably didn’t read the book, as he died in the UK on July 30, 1975, soon after Options was released in the US (June, 1975). But he likely would have hated it had he done so.